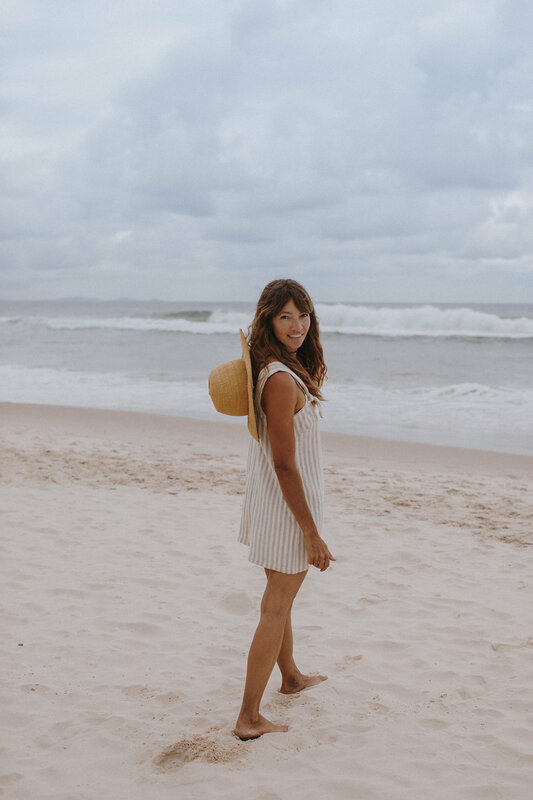 London-based Naomi Raybould from Beyond Nine recently spent a month here in Byron Bay on holiday with her family. She reached out to me to share a sneak peek at her new linen collection and asked if I would play dress up in her new jumpsuits for a photoshoot with my friend Amelia Fullarton. I was so flattered to be asked, I very happily signed on. How pretty are these new linen jumpsuits? I love all the colours so much, I can’t even choose a favourite. The jumpsuits, available in a short version and a long, are designed and handmade in London from a super soft linen, which will only get softer over time. They’re designed to accommodate a growing bump in pregnancy, but look equally good when not pregnant — and they’re even breastfeeding friendly with tie-knot straps on the short jumpsuit and easily pulled-down straps on the other. One of my good friends here in Byron just had her third baby and she’s been living (and breastfeeding) in hers. The new linen jumpsuits are available now for pre-order. Perfect for summer in the northern hemisphere whether you’re pregnant or not! Bellerose, a favourite label for boys!